Already bored with eating normal cakes? 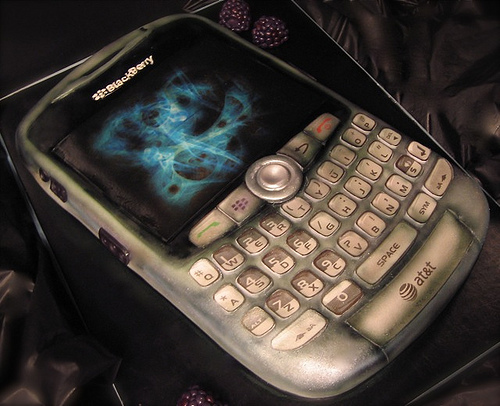 try new geek cake designs..
1. Geek Cupcakes!!! Too Cute! These are by far my favorite cupcakes EVER! 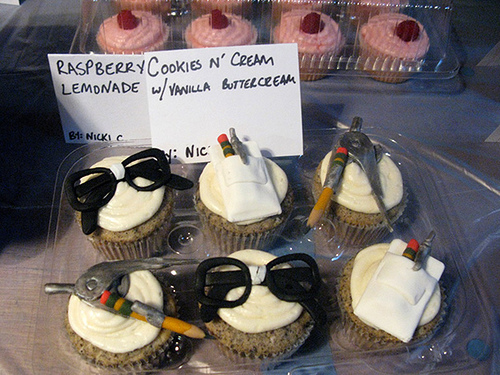 How cute are the pencil protectors, taped glasses and compasses? Yummo! Made by Hey There, Cupcake! found on Flickr. Mark Randazzo, who has a bakery, Mark Joseph Cakes, got a lot of buzz for his cake-making skills onBoingBoing, Gizmodo, Elite Choice and more. 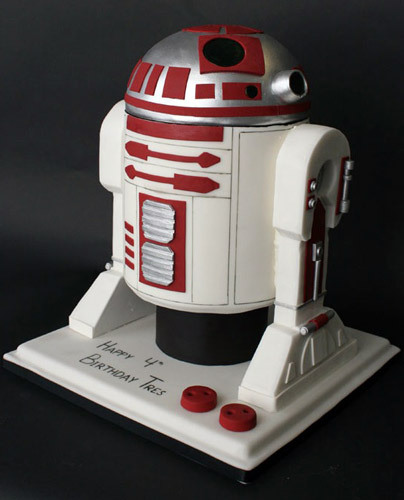 Now, you can get the instructions on how to make your very own R2D2 R2M5 cake at B-Side Blog from Mark. The legs are made from Rice Crispie treats too! So these are CUPCAKES and not a cake… but too cute to resist. This is perfect for any kid who grew up in the 80′s. 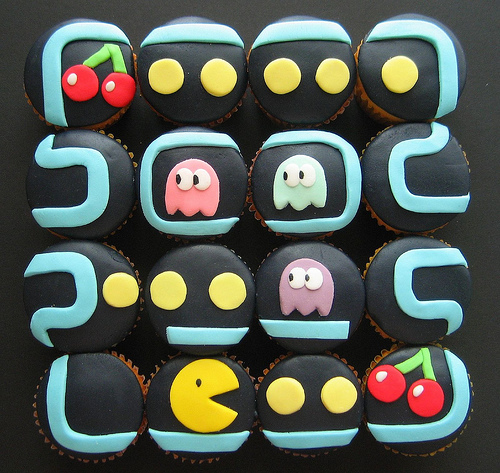 From Flickr user hello naomi – these PacMan cupcakes look too delicious to eat. This delicious dragon was made by Mike’s Amazing Cakes for some kind of Dungeon and Dragon party. 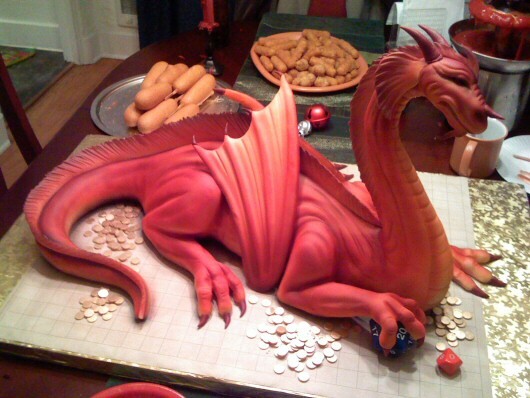 If you can’t afford to have one made, you can try to make your own dragon cake – but it probably won’t be quite as amazing. 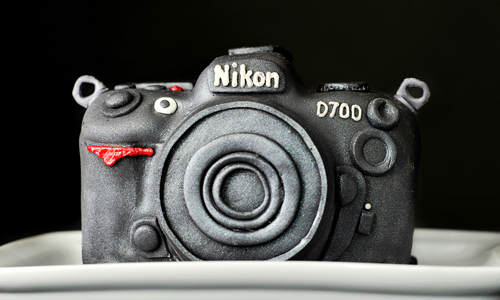 A Nikon Camera Cake (via fsumaria). 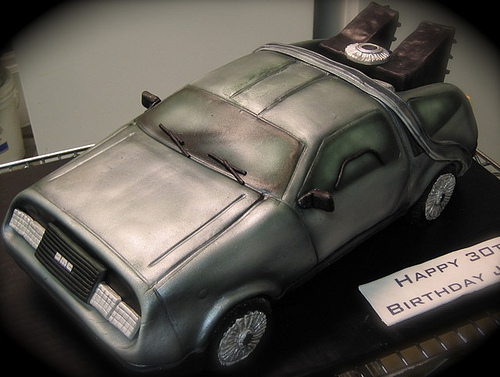 This cake is from a bakery in Pennsylvania called Granny Schmidt’s. The outside was made of fondant and the inside is red velvet cake. This cake was actually made for a wedding! I wonder if the bride was dressed as Peach. Actually, after the bride and groom went around looking for a Mario and Peach wedding topper, the bride decided to surprise the groom on their wedding day with this masterpiece. Read the full story here. 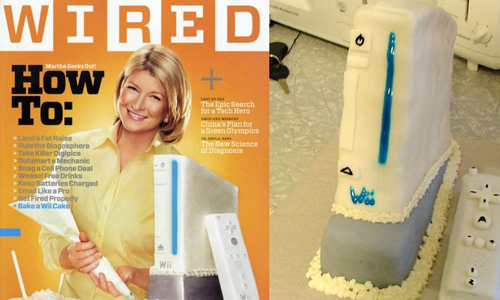 Back in July, 2007 Wired Magazine’s “How To” feature included a Wii Cake that was inedible due to support structures. However, Brian Walak actually created one that you can in fact eat – and ended up on Martha’s show. 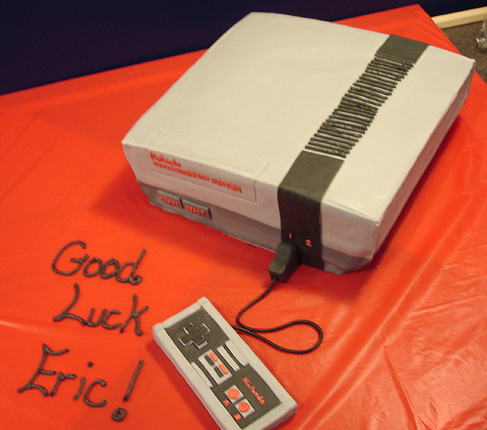 Here’s instructions on how to make your own Wii cake and is another wii cake version by craftastica. I wonder if Martha has ever even played a Wii? 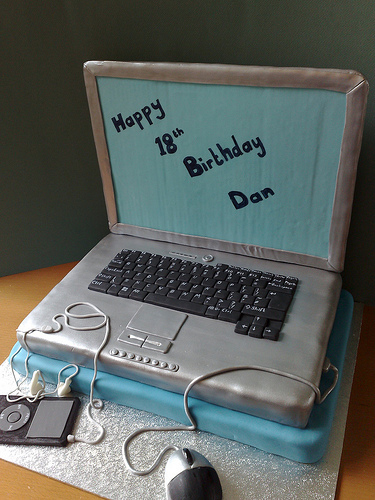 By Small Things Iced – Everything is edible except for the screen, it is a chocolate cake with chocolate buttercream covered (bottom layer) with blue fondant and then the top layer (laptop) is the same but covered with grey fondant then painted silver. 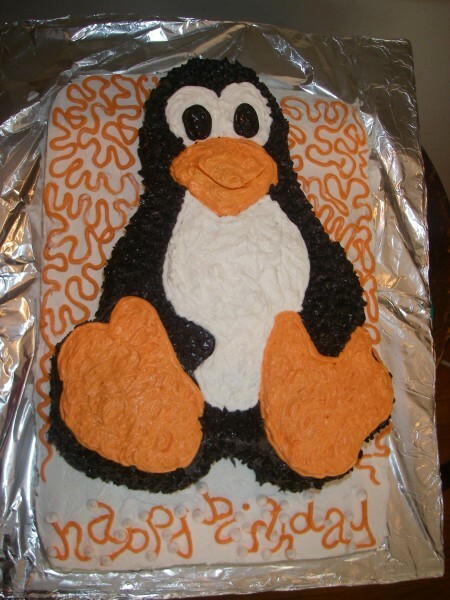 This one is perfect for your open source geek. 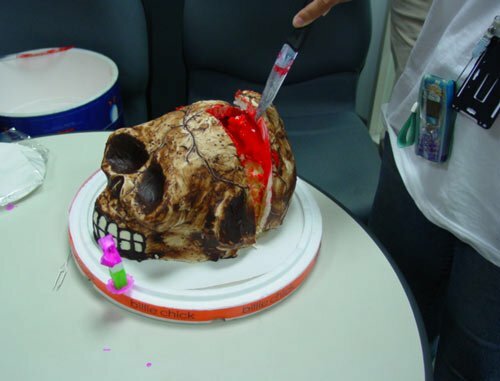 See how to make your own at Killer Cakes. 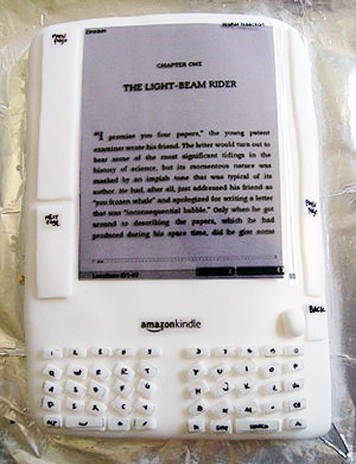 Kindle is a wireless reader and Geeksugar shows you how it was made. 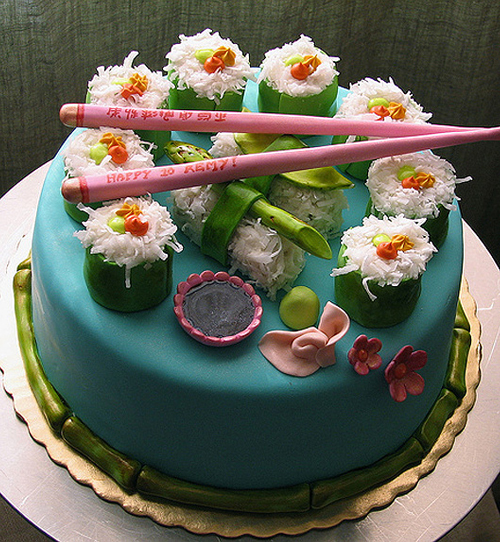 A Helio Ocean CAKE!!! This was made by a girl for her boyfriend. Details over at GeekSugar. 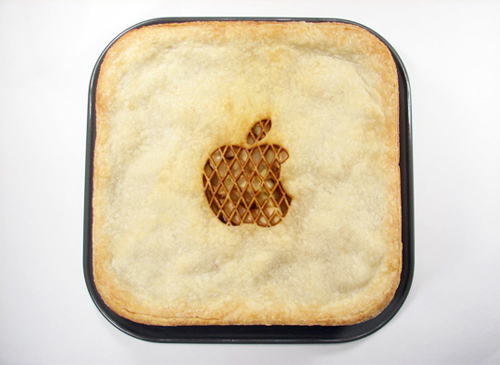 Okay, so its not a cake but who can resist apple pie? APPLE, apple pie that is! See how it was madehere. 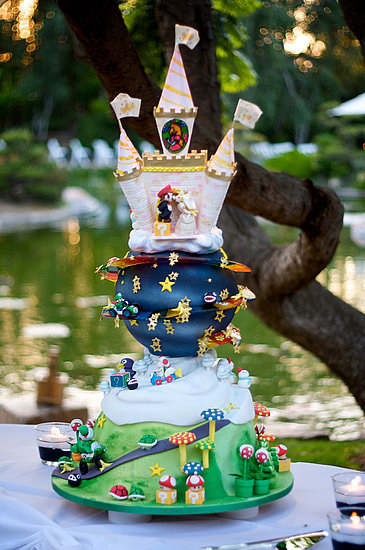 This Mario Kart wedding cake is simply stunning. All kinds of detailed photos can be found here. 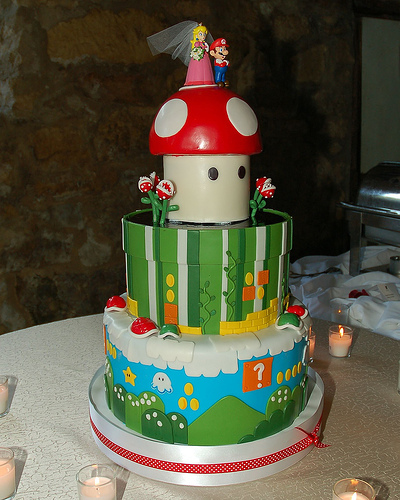 If you are not in the market for a wedding cake, I also found this cool Toad/ Mario Kart cake on flickr by Debbie Does Cakes. Continuing on the Mario theme, next up are these Super Duper Super Mario Cupcakes. 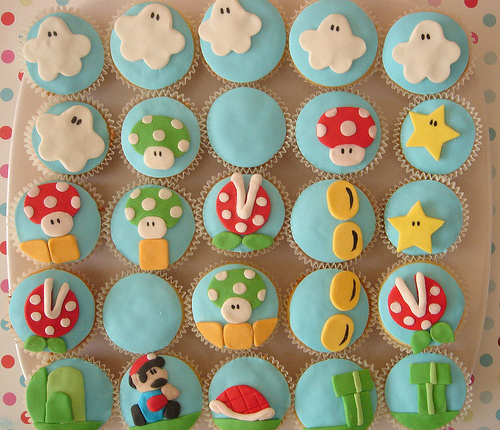 Debbie Does Cakes has a nice version of Super Mario Cupcakes as well. 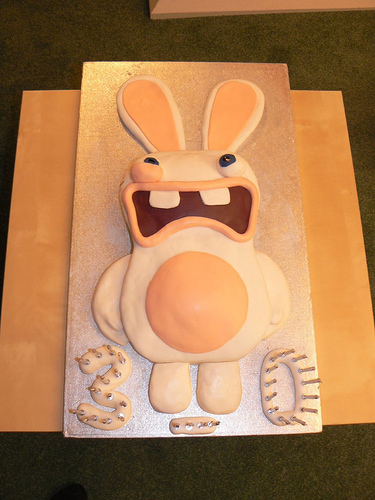 Found over at geekadelphia, made by Zoe Lukas this is made out of spiced carrot ginger cake with cream cheese icing. All those cute little details, the chopsticks, soy sauce bowl, snap peas… they aren’t plastic. Those are edible, made out of gum-paste, and the bamboo, wasabi, ginger… made out of fondant. The rice is coconut. If you have a hankering for twinkies, check out hostess snack cake sushior look at these stunning sushi cupcakes on Flickr by Debbie Does Cakes. Debbie Does Cakes is the master behind this cool Beer bottle cake too. What can she NOT do? 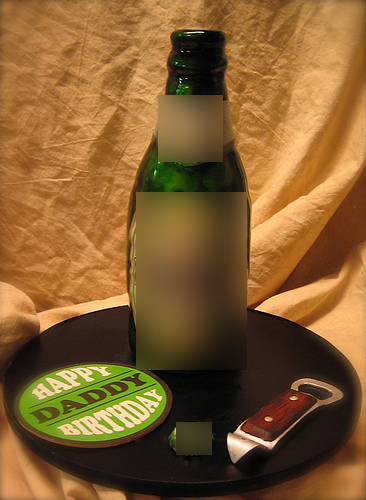 Update: I had to blur the bottle because I was told it was using a trademark even though I did not make the cake. Still it’s an amazing cake. 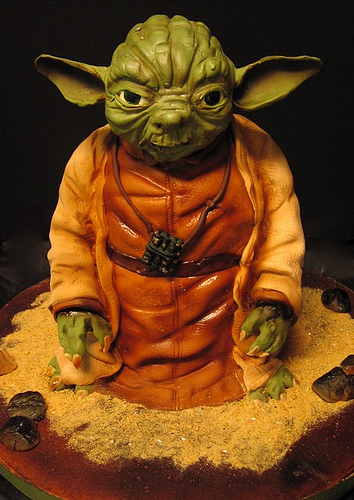 Defies gravity, this Yoda Cake Does… yes… hmm? 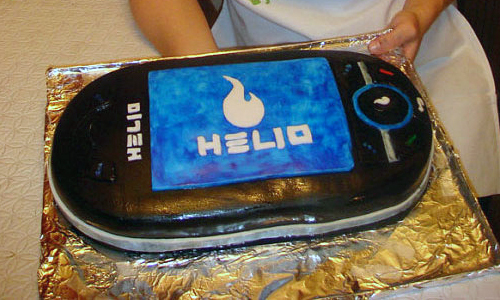 The cake is yellow, the controller is two Hershey bars with nougat between them, connected to the cake by black licorice, and the whole thing is that hard-sugar frosting. 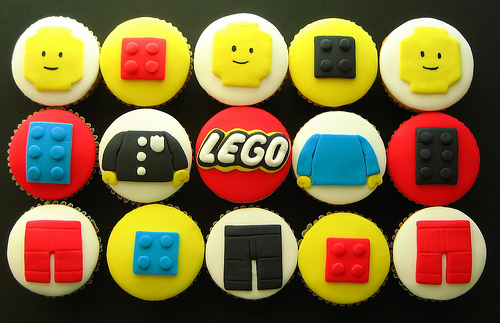 These Lego cupcakes are made by another Flickr baking super star Hello Naomi. I love playing with Legos! Crack Berry anyone? Check out the detail on the screen and the perfect buttons. Amazing work byDebbie Does Cakes. 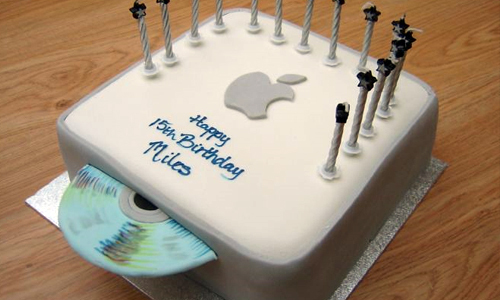 Can i haz this cake pleze? Who doesn’t LOVE “Back to the Future”? Transformer’s aren’t just for little kids anymore the one above was commissioned by a girl for her boyfriend’s 30th birthday and was The cake was modeled after the Robot Heroes version of Optimus Prime, the one that was released in the first wave of these toys. 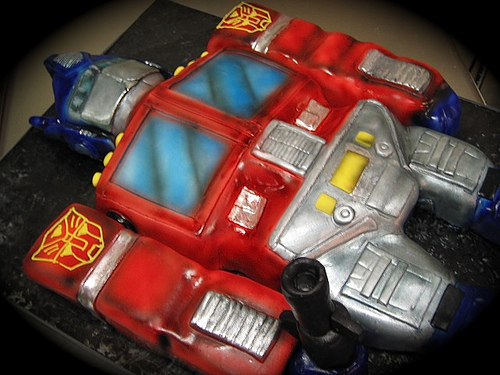 Check out this step-by-step set on Flickr that show you how to make your own Optimus Prime cake. Raving Rabbids happens to be one of my favorite games on the Wii. 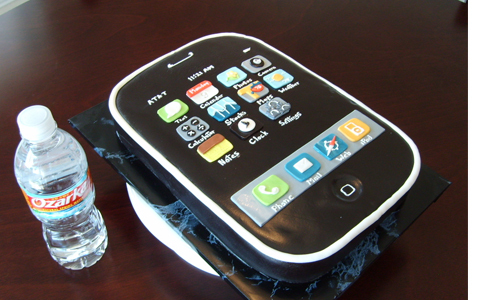 Found this cake on Flickr. I have yet to play Gutiar Hero but my guess is that I would be horrible at it because I have a really bad ear for making music. I tried playing the violin in grade school and was always in the last chair. 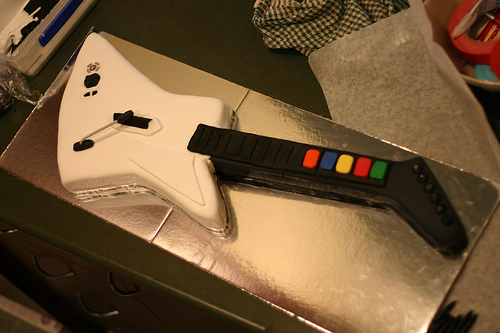 Anyway, if you want to make your own Guitar Hero Cake, check out this detailed tutorial.